How frustrating is it when you can’t connect to your elderly family? Do you know when they need help or are you fully aware that they are OK and following their daily routines? The world’s getting a smaller place, technology is getting more interconnected and families are now living further away from each other than ever. Old people can sometimes feel on the sidelines in this new world, not really grasping new communication technology but still wanting their own independence. A new product is has been developed to try and bridge this gap and offer peace of mind to you and your elderly family. The Carehub, simply put is a new gadget that offers a host of features that help families care for each other and stay in touch. ‘The whole idea for the Carehub started with 2 brothers who worked abroad and were looking at a way to stay in touch with their 75 year old mother, like many elderly people FaceTime and Skype proved difficult for them to use. So they were looking for a simple device to communicate with their mum to their smartphones, they couldn’t find one. This necessity was compounded when their mum fell in the shower, dislocated her shoulder and took a few hours for them to find out about it. Two Way Communication: How many times have you tried to teach your parents to use Skype or FaceTime for a two way call…and failed? 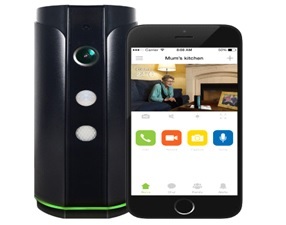 With the Carehub it couldn’t be easier, mum presses the button on the top of the unit and calls straight through to the app. Motion/ Non-Motion Alert: Do you want an alert in the morning when mum gets up and makes breakfast? Or more importantly, do you want an alert if she doesn’t get up and trigger the motion sensors before 10am? Critical Temperature Alert: In many countries, elderly people run a serious risk of illness or worse because their homes reach a critical temperature as they generally tolerate the conditions to save money on their energy bills. The Carehub can be set to alert you if your parent’s home has reached to a critical temperature so you can act quickly. You can record an audio message from your smartphone and set the times and days when this message should activate on the Carehub device. There will be an audible beep from the Carehub and the LED will flash purple. Mum presses the button on the top of the device to listen to the reminder message. Motion Activated Nightlight: To minimize the risk of night-time accidents the Carehub has a nightlight which is activated from the motion detector. Local TF Card Storage: A lot of people have concerns over remote storage of home images. Many other cameras on the market use cloud storage video images and charge extra for subscribing for this. We keep it simple, the Carehub has local storage on a TF card which can be retrieved locally. And with no cloud storage comes no monthly subscription charge! Gavin Munro, Don’s brother and marketing manager of Efergy Technologies is confident about this product.